DESCRIPTION: Construction on the Gloria Way Well upgrade in the City of East Palo Alto, CA (“the City”) has been completed and will produce up to 300 gallons per minute of potable water which represents a critical milestone in diversifying the City’s water supply portfolio. This $3.2 million project was completed by Integrated Water Services, Inc. (IWS) and included a new well pump and Iron and Manganese removal system. The Gloria Way Well was constructed in 1979, but was taken out of service in the early 1980’s over complaints about the water’s “esthetic” qualities including a bad smell. The City gets its water from the San Francisco Public Utilities Commission (SFPUC), and is guaranteed 2,199 acre-feet of water per year, which is close to its current demand. The City doesn’t have storage capacity, so it doesn’t have a buffer against demand spikes, drought restrictions, or interrupted water service. The City also needs water for growth. The IWS scope of work for upgrading the existing well site included: a) demo existing site infrastructure; b) installation of a new submersible vertical turbine well pump; c) installation of an iron and manganese treatment system by Pureflow (www.pfdiv.com); d) chemical feed, metering, and storage system; e) blending tank; f) booster pump system; g) electrical and controls; h) and conveyance piping and tie in to existing utilities in the street. In terms of the treatment process, the manganese in the water is first oxidized by injecting sodium hypochlorite into the raw groundwater and then the resulting manganese oxide is removed by filtration when passing through the manganese pressure filters. 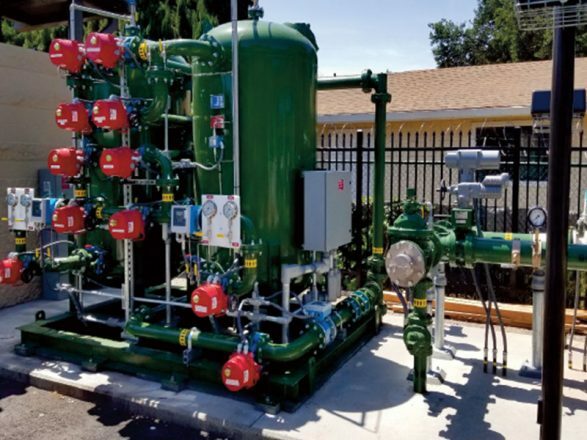 The treated groundwater would be further chemically conditioned with sodium hydroxide, ammonia, and fluoride before being conveyed to a mixing tank where the treated groundwater is blended with the SFPUC water supplies. The engineer of record for the project was Erler & Kalinowski, Inc. (www.ekiconsult.com). The well site was located on a residential neighborhood corner lot, crowded with a number of existing utilities in the street and at the well location. In addition, the site was relatively small and located on a busy residential corner. IWS worked with the stakeholders (City, residents, suppliers, and vendors) to maintain a safe work site, reduce impact to vehicle and pedestrian traffic, and maintain good relations with the neighbors. Jeff Tarantino, PE of Freyer and Laureta, Inc. (www.freyerlaureta.com), the construction manager for the project, was impressed with IWS efforts: “IWS was able to work in a very small and confined area to execute the project without interfering or disturbing the residents. In addition, the project was located in an underground utility corridor that made work challenging and required attention to detail to avoid damage to the existing infrastructure. I would give high marks to IWS and would strongly recommend them for future projects”.